Above: Notice posted in front of the Confederate Women of Maryland monument at Charles Street and University Parkway. Signs have gone up around Baltimore’s Confederate monuments, asking people to weigh in on what should happen with them. 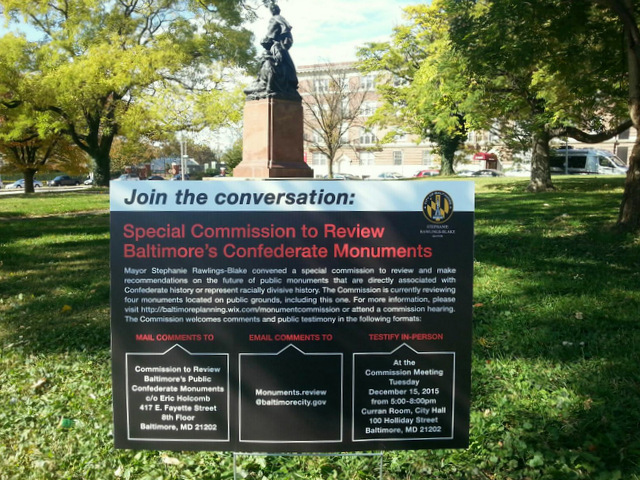 The signs have appeared around four monuments that are under review. They are the Confederate Soldiers and Sailors Monument in Bolton Hill (also known as The Spirit of the Confederacy), the Confederate Women of Maryland monument at Bishop Square Park at North Charles Street and University Parkway, the Robert E. Lee and Thomas J. “Stonewall” Jackson Monument in Wyman Park Dell, and the Roger B. Taney statue in Mount Vernon. South Carolina was the first state to remove items related to the Confederacy when it took down the Confederate flag from the State House grounds earlier this year. The state took action after nine people were shot at a black church in Charleston. Photos later surfaced of the shooter, Dylann Roof, posing with the Confederate flag, which started a nationwide debate over public references to the Confederacy. Since then, other cities and states have begun to evaluate their own holdings to see what Confederate-related statuary or artifacts may be offensive to residents or inappropriate for display on public property. Rawlings-Blake announced the creation of a special commission last June. Already, its work has sparked controversy. The panel posted the signs because panel members want to get a wide range of suggestions from city residents and others about the monuments, said Ryan Patterson, coordinator of the city’s Public Art Commission and staffer to the special commission. “The signs are there to remind people that there is a conversation happening, and they are welcome to contribute,” Patterson said. • Leave the monuments exactly as they are. • Keep them with conditions, such as new signs or other changes to help explain it or put it in context. • Relocate the monuments, but keep them as part of the city’s inventory. • Remove the sculptures and de-accession them from the city’s collection. The commission has three more public meetings before it makes recommendations to the mayor. The meetings are scheduled for tomorrow (October 29), December 15 and January 14, 2016. People can make their opinions known by mail, by email or by testifying in person at the December 15 meeting.